VLCC De Tan + White Glow Moisturising Body Lotion SPF 30 PA+++ is an effective formulation that moisturises and soothes the skin while offering sun protection against UVA and UVB rays thus preventing premature aging & tanning. Enriched with the goodness of Aloe Vera extracts, it soothes the skin, brightens skin tone, moisturizes & hydrates while fading tan and leaving skin nourished & glowing. Additional Information: With the motto of ?Transforming Lives? VLCC aims to spark self-transformation, spread happiness and imbibe every individual with wellness. It is widely recognized for its therapeutic approach to beauty and weight loss solutions. Started in 1989, VLCC has now expanded its horizons to skincare, hair care, body care, functional foods and fortified foods products. Explore the entire range of Body Sunscreen available on Nykaa. 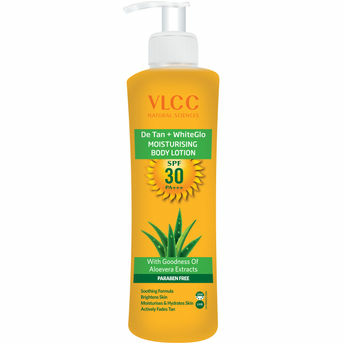 Shop more VLCC products here.You can browse through the complete world of VLCC Body Sunscreen .